Last week, Delta Council approved the Northgate project — Century Group’s proposed mixed-use development for the former Southpointe Academy site, which extends from 18th Avenue to The Coast Tsawwassen Inn on 56th Street in Tsawwassen. The Northgate project includes 41 one- and two-bedroom character townhomes on 55A Street, a six-storey terraced landmark office building on the corner, and a four-storey, 64-unit seniors’ independent living community on the balance of the site. The seniors’ building is unique in that it is designed to share services with the Hotel — such as kitchen, housekeeping and laundry. The building will also feature a communal dining area and amenity area for social and recreational activities. Northgate includes a number of innovations such as rainwater infiltration, a green roof on the office building, and community gardens for the seniors and townhome residents. The project also features an inner courtyard with a walking loop, and cars tucked away in an underground parking garage. 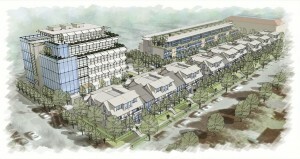 We look forward to seeing this project proceed in early 2013.